Rainy Day activities in the Bay of Islands. The Bay of Islands might be renowned for its beautiful sunny days, but it does rain occasionally. This is New Zealand, after all. But never fear, for there are many ways to enjoy the Bay of Islands on a rainy day! Just take a look at the activities below! Keep out of the rain by visiting the many historical sites of the Bay of Islands, like the Waitangi Treaty Grounds, the Stone Store and the Russell Museum. Some tour operators can even show you around areas like Russell without having to get wet! That’s not to say that those who want to thrive in the liquid stuff can’t with opportunities to go scuba diving and swim with dolphins. Eating is also a great option when it’s raining, and the Bay of Islands has plenty of opportunity to drink wine and taste chocolate. If glowworm caves aren’t exciting enough, then there is always the option to check out New Zealand most famous public toilets! Isn’t that just too enticing?! For more inspiration on things to do in the Bay of Islands on a rainy day, check out Bay of Islands – Guide for Backpackers. Mostly being undercover, the Waitangi Treaty Grounds is the perfect rainy day activity in the Bay of Islands. Learn about how New Zealand became a nation by visiting the Museum of Waitangi, check out the giant waka (war canoe), watch a cultural performance in the carved meeting house, see a colonial house and more! Disclaimer: you do have to walk short distances outside between the attractions so prepare to make a run for it if it’s raining! Find out more about the Waitangi Treaty Grounds at 5 Reasons to Visit the Waitangi Treaty Grounds. There are many cruise options from sailing to dolphin swimming, but even on a rainy day you can enjoy exploring the islands out on the water. Many vessels have indoor cabins and covered outdoor areas so you can still enjoy the views without getting too wet. Why not mix that with dolphin swimming? You’ll get wet anyway! Location: Tours from the Paihia Wharf & Russell are available with Explore NZ and Fullers GreatSights. Additionally, Albatross V Expeditions offers tours from Russell. A cave is an inside activity, right? Keep out of the rain at the Kawiti Glowworm Caves where you can see a display of these fascinating creatures hanging from the cave ceilings. Listen to your Maori guide tell legends of the caves and the life-cycle of the glowworms. Check out more caves in 7 Places to See the Famous Glowworms in New Zealand. You’ll know it when you see it. The Stone Store is an unusual-looking building compared to others in New Zealand as a huge stone building. With a gift shop on the ground floor and a museum upstairs, there’s plenty to see in this heritage building. Tours also run to Kemp House next door which is the oldest surviving house in New Zealand. Makana Chocolate Factory in Kerikeri has free chocolate tastings; what’s not to love? Stay out of the rain and watch the chocolatiers working in the chocolate factory behind a glass wall. Treat yourself to a naughty desert in the cafe next door or pick up some chocolatey gifts for the family back home. Well, if you’re going to get wet anyway, why not scuba dive! The Bay of Islands is thriving with life making it one of the tip dive locations in New Zealand. Explore reefs teaming with fish, sea urchins, kelp forests and more! If you’re a qualified diver, you can even check out the wreck of the Canterbury and delve into sea caves. Who knows, you may even spot dolphins along the way! There are more dive locations in New Zealand listed in 10 Places to Scuba Dive in New Zealand. Location: Paihia Dive, Dive North and Dive Zone Bay of Islands all operate in the Bay of Islands. Russell was New Zealand’s first capital and was even dubbed the “Hell Hole of the Pacific”. Learn more about it’s fascinating history on a Russell Mini Tours. For most of the journey, you’ll be inside the bus listening to your guide’s commentary, yet still getting to explore the place. Just hope that the rain dies down by the time you get to Flagstaff Hill, a significant historical site with awesome views of the Bay of Islands. The Duke of Marlborough is New Zealand’s first hotel and first licensed pub so it is only fitting to have a drink there. Watch the rain patter against the windows while looking out onto the beach. The interior is decorated with artifacts from Russell’s “Hell Hole” days so there is enough to look at while having a beverage with your travel mates. 9. Use New Zealand’s famous toilets! Yes, we’re being serious. The Hundertwasser Toilets are the funkiest public toilets you’re ever likely to do your business in. Designed by a local architect legend, the Hundertwasser Toilets are colourful and creative with ceramic tiling. What’s more, you can enjoy them on a rainy day too. Check out a number of displays commemorating the early Maori tribes of the area, as well as the whaling days and why Russell was known as the “Hell Hole of the Pacific”. For a small fee, you can check out old artifacts, see colonial photos and check out a whaling boat. Kerikeri is a hub for fruit-growers and vineyards (keep that in mind when looking for fruit-picking jobs). With that, there are a few wineries around where you can treat yourself to some tastings and food, all while keeping out of the rain! Check out more winery experiences in 9 Great Winery Tours in New Zealand. Location: Marsden Estate, 56 Wiroa Road; Ake Ake Vineyard, 165 Waimate North Road; Cottle Hill Winery, 28 Cottle Hill Drive, and Fat Pig Vineyard, 177 Puketotara Road in Waipapa. Get some inspiration for your gap year in New Zealand by binge watching “New Zealand’s Biggest Gap Year” on YouTube! 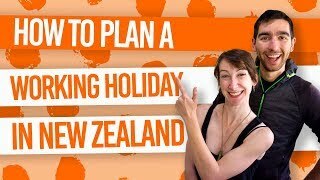 Check out Robin and Laura tackling 365 Activities: 365 Days in New Zealand! Don’t forget to subscribe!